Starting with the eyes, there are 2 permanent eyeshadows, as well as a new highlighter for the the cheeks. 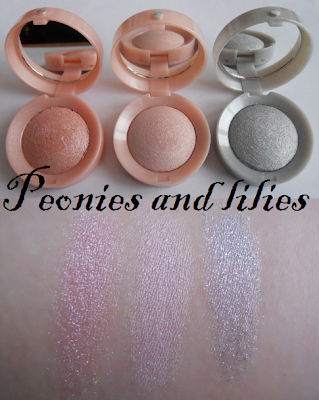 As you can see from the swatches, all the colours are super pretty- the highlighter and silver eyeshadow are quite glittery, whereas the pink eyeshadow has more of a delicate shimmer. There are also 3 smokey effect pencils, in Ultra black, Sand rose and New wave blue. Of the 3, my favourite has to be Sand rose, which is a gorgeous mauve colour. The pencils are soft and creamy, and come with a small smudge brush so they can be blended with eyeshadows, to create an easy smokey eye. 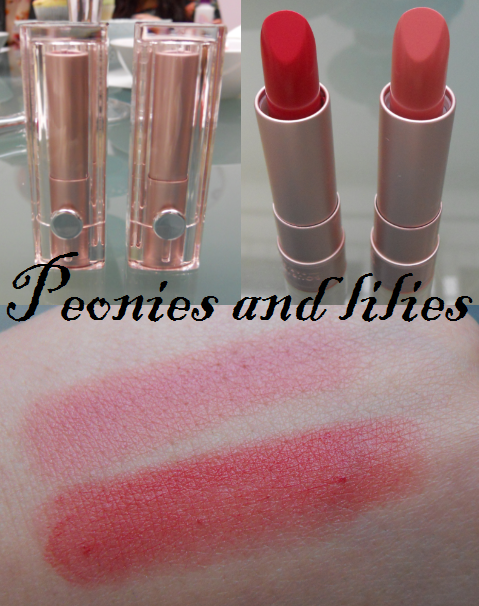 For the lips, there are 2 colours- Rose innocence - a rose pink and Rose passionne, a reddish coral colour. I've never tried Bourjois lipsticks before, but how nice is the packaging, the plastic casing reminds me of the much posher Dior addict lipsticks. Finally, there are 2 nail varnishes, Rose satin- a baby pink and Blue asphalte- a beautiful grey purple colour that I absoutely love! I've worn this shade non stop since the event, and will be featuring it in a NOTD very soon! Bourjois Paris Ballerine will be due for release in April 2011. What do you think of this collection? Any of the colours catch your eye? The idea is nice, but I guess I'm not a fan of Bourjois pigmentation. It's kind of weak compared to other brands that aren't pricey. Wow, I don't think I've ever liked a new collection this much! I haven't used many Bourjois products. I did have a lipgloss but wasn't too keen and I did have a blusher but I didn't like the brush and it was so glittery that the shimmer went all over my face if I brushed my cheek. Their eyeliners have been pretty good though. So...hmmm...I don't know. Gorgeous eyeshadows, highlighter, eyeliners though, and I really like the pink lipstick! :) I really have started spending so much since I started looking at your blog. I <3 everything you buy, especially your Primark finds. Hehe, I bought the black tights with the little bows yesterday! I should comment more often! Bee - Aww thank you, I'm really glad you like my Primark purchases, those bow tights are so cute! You've even got a non-makeup girl like me excited about it with your great pictures and swatches. These look like feminine possible wedding makeup colours to me. Thanks for the post Fei! the darker colour nail colour looks so unusual and I think the lipsticks look fab. have never tried bourjouis lipsticks but the darker coral one looks so pretty I want to check it out now! The lipstick shades are beautiful. Thank you for swatching these. I love both colors but am not sure where to find these in the US.